Perhaps no model better typifies the Keurig name than the classic K55 design. It’s a no-frills model with a large removable water reservoir, a time saver that allows you to brew a cup quickly when you’re craving caffeine, and it permits brew sizes of 6, 8, and 10 ounces. It’s also compatible with major coffee brand K-Cups, so there’s an endless variety of flavors and brews available. It comes with a descaling feature to ease cleaning it, and it turns itself off so you can just enjoy your cup of joe. With good comes bad, and in the case of the K55 there are reliability issues. The water pump might last three uses, or it might last several years. Still, for quality coffee at the press of a button, it’s hard to deny the K55’s value. 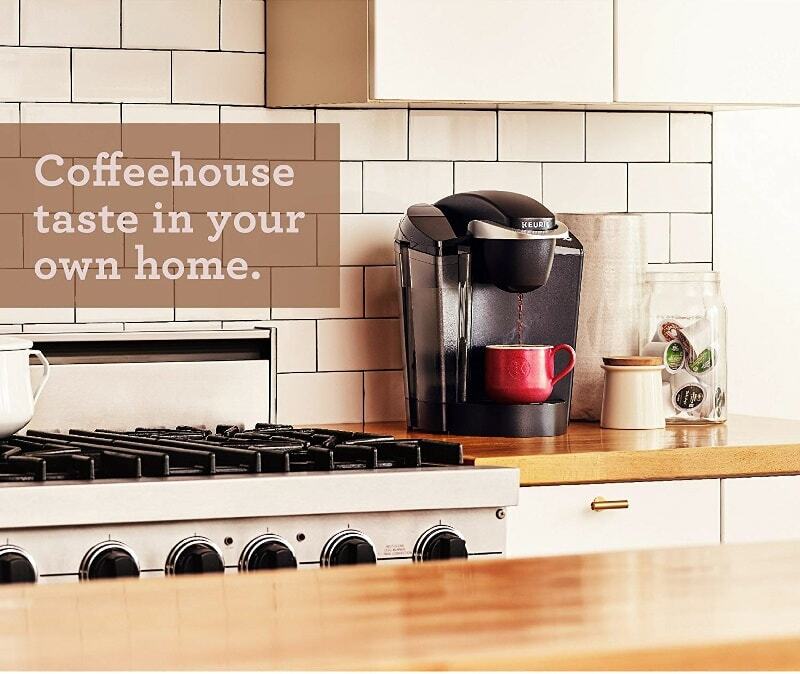 From brewing three different-sized cups of coffee to cleaning and descaling, everything on a Keurig is as simple as pressing a button. Need a small, powerful jolt of caffeine? Press the six-ounce button. Want a nice, leisurely cup of coffee that won’t leave you jittery? Hit the 10-ounce button. It’s no more complicated to clean and descale, and if you forget to turn it off, it’ll turn itself off and save you money. The K55 features a large 48-ounce removable water reservoir so that you don’t have to add water every time you want a cup of coffee. If you drink only 10-ounce cups, you can get nearly five full cups before you need to add more. If you like small, strong cups, you can get eight six-ounce cups of coffee. Variety is no problem for the K55. It’s compatible with pods produced by more than 70 of the world’s leading coffee roasters, which means you can select from more than 400 different flavors. If it’s a warm summer morning, you can grab a light brew. If it’s a cool autumn afternoon, give a pumpkin spice brew a try. In fact, there are enough flavors available that you could have just one per day and not repeat for more than a year. 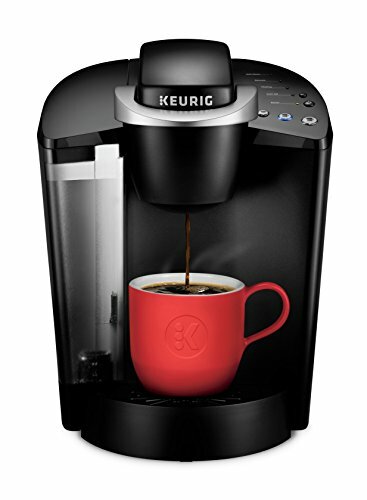 Is this machine compatible with Keurig K-carafe and/or K-mug pods? The K55 is compatible with standard K-Cup pods from almost every major coffee roaster, but it is not compatible with K-carafe or K-mug pods. How often should I clean/descale my Keurig? That depends on what you brew and the hardness of your water. If you brew regular coffee with normal water, cleaning once a month and descaling every three months is a good maintenance schedule. If you brew, say, tea, you’ll want to clean it right away. If you have harder water, you’ll want to descale more frequently. Does it brew to equal strength for each cup size? No. The smaller the cup, the stronger it will brew. A 10-ounce cup of coffee will not be as strong as a six-ounce cup. What verdict is there on the K55 from that most impartial of juries, the Internet? We surfed reviews, reading them and trying to pick up useful tips about what experiences people have had with the K55. Was our experience similar? Did we learn anything valuable to pass along to you? For the most part, people who bought the K55 were pleased with their purchase. Users liked the variety of sizes and variety of roasts and flavors. And, of course, there was the simplicity. Just slip a K-pod into the holder, shut it, and press a button. Out comes a cup of coffee tailor-made to your tastes and cup size preference. It’s a simple machine to serve pretty simple needs. However, other users noted a tendency for the pump to just stop working. This was sometimes after a cup or two, and sometimes after a month of consistent usage. When it comes to a Keurig, we’d expect a lot of the low rankings to come from people upset over the plastic garbage issue, but most of the customers dissatisfied with their K55 cited the pump’s tendency to fail. It’s also no small percentage of reviews that are based on this, suggesting that it’s not a matter of the occasional lemon in the bunch. While that’s useful to keep in mind when purchasing, it’s also useful to keep in mind that this was still a minority viewpoint when it comes to the K55. A much larger percentage of customers didn’t have problems with dying pumps and reported that the experience of owning and using it was a pleasurable one. Keurig’s K55 allows you to brew a nearly endless variety of flavors and brew strengths from most major brands in the most popular serving sizes. It’s designed for simplicity and ease of operation to satisfy your caffeine cravings. If your needs are no more complicated than that, it’s an ideal coffee maker. You’ll need to use a second pod to make a cup for a friend, and its pump has a reputation for failing for no apparent reason. If you are a heavy coffee drinker and go through multiple K-cups per day, you might want to look at a model with better durability, because the only thing worse than a broken coffee maker is a caffeine fiend who can’t satisfy their craving because of a pump failure.